Using single turn PTFE back-up rings will help control O-Ring extrusion in high pressure applications. PTFE back-up rings are compatible with all hydraulic fluids since they are virtually chemically inert and can also be used in applications involving elevated operating temperature conditions. In addition, PTFE back-up rings can greatly improve O-Ring performance and extend service life, even if extrusion does not present a problem. 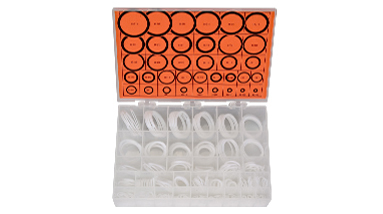 This 36-compartment kit contains a total of 325 single turn back-up rings in 36 different MS28774 sizes. This style features a 22° scarf cut to facilitate installation. Included with each kit is a contents identification card which lists the size and actual dimensions of each ring.